As well as the "big models" that got mentioned previously, GW are bringing out a whole new range of Beastmen. I'm not a Beastman player and wouldn't bother with an army, but I had a look anyway. *I* am a Beast player and at THOSE prices I'm not looking to add any of their fugly new models. Pumbagor anyone (that is what we've dubbed the Razorgor, seriously what were they smoking). I don't like the ungor heads though. There's just something of with them. I preferred the old "impish" look over the bearded satyrs. People say the minos are really suffering from the paint-job (smart marketing move there), they are a little better in the plastics. But still not impressed with the steroid rats. And don't get me started on moving Ungors to smaller bases than the old models. We are not amused. The rules themselves might be a slight improvement though they destroy what many considered to be the important feel of Beasts. Seriously the children of Chaos have no marks. I actually yesterday played a game vs a guy using an army that to 70-80% will be gone in the new armybook. I'm going to amuse myself with putting large red Xs on the units that are gone in the pictures. Those are some rather hairless beastmen. NBKFuzzy wrote: Those are some rather hairless beastmen. Its late here so if the following joke doesn't take I'll blame it on that. Personally I don't realy like the new models, the have to less hair. The Razorgor is just plain ugle, if the Razorgor is any good I will buy some boars and convert them. The minos could work with a little greenstuff I think. And of course the rebasing of the ungors, what kind of morrons are working at GW all beastmen players (like me) will probably glued them to there base. Splitting the beast herd in two units is another thing I don't like about the new book, now I will have a gor herd with 2 command groups and one ungor herd without command group. Part of the problem with the minotaurs probably is the lack of hair, and the paint job doesn't help by emphasising the muscle so much. Not sure if it is what you meant, snowblizz, but I did think that the minotaurs looked a bit more rat or other-animal like - a bit more like the Rat Ogres, which are pumped-up experiments on the Skaven equivalent to steroids, rather than excessively muscular man-beast-monsters! I'm not sure where I'd sit on the Chaos Marks issue. To be honest it might be a good thing, as they did always strike me as more of a "herd worshipping Chaos Undivided" rabble/horde rather than organised groups with particular allegiances. By removing Marks from the beasts it gets you to more of a distinct "corrupt beast-man hybrids" army rather than "slightly more bestial marauders". I cant wait to use more of the models, especially looking forward to using the spell which turns all the mounts of the enemies models turn on them! Have to agree with the Ungor comments though, they do look awful, but they're cheap and can be used as raiders with bows... Next wave looks even more interesting too! If you don't mind a quick shave. Gothor, have you seen the older models? (The ones where a Minotaur looked like a large, scary, shaggy beast rather than some kind of bald rat) The new rules might be okay, but I've only seen the models and they just don't quite look right. Beastmen should be making people cower in terror at horrible man-beast hybrids, not making them laugh at bug-eyed boars! That link to bald rat is incredibly random. But by far my favourite has to be the new Doombull, the axe head alone is rumoured to be the same size as a Goblin model, and to me, thats freakin' awesome! The Doombull doesn't look that bad, because he has hair or armour. I think it is the sheer baldness of them that just makes them look so silly. When was the last time you saw a cow showing pale, pasty-pink human flesh with absolutely no fur at all? All opinions aside, everybody laughs at beastmen armies now due to their sillyness. Almost looks like they are creatures from Narnia. Pumbagors. I thought it was bad. I was wrong. It is worse. Much worse than I could have feared. If these models are stock I can't even begin to comprehend the mind of a) the person who made them and b) the person who approved the design. Edit: the pictured Pumbagors are conversions, based on the original, and shows up in the Feb. bat rep. So someone thought the bulging eye look was cool enough to make 3 different ones. Now I've heard that the Minotaurs are better in the flesh (so to speak) than in GW's images. 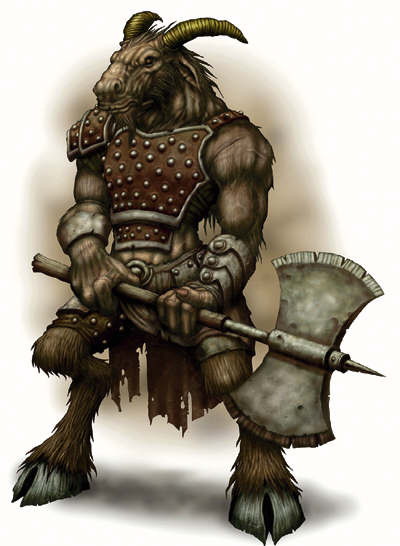 It is sad, Avatar of War has made a rocking Minotaur and GW makes Belgian Blue Rats. I've been throwing away money on GW on the strength of the model line. Now that's gone there's little else left. Last edited by snowblizz on 26 Jan 2010, 14:08, edited 1 time in total.